Salmon planting truck at Fort Baker, north end of Golden Gate Bridge. The ocean salmon fishing outside of the San Francisco Bay has been very good the last couple of years. In 2017 all you had to do was get on a boat heading south from the Golden Gate. After an hour or two ride you started fishing and the boat was limited out. You spent more time travelling than fishing. In 2018 you headed north and the salmon were thick off the Marin coast with limits the rule for much of the season. These recent ocean salmon catches have shown an unusual number of fish from the Mokelumne River Hatchery. The Mokelumne River facility produces less than 25 percent of the salmon from the Central Valley yet they were responsible for more than 40 percent of the catch. After hearing about these numbers I started asking around and ended up on the phone with Bill Smith, manager of the Mokelumne River Hatchery which is located at the base of the Sierra between Sacramento and Stockton. The story behind the salmon success on the Mokelumne goes back to the 1970s when the Commercial Salmon Fishing Association petitioned the state to increase salmon production via a tax on the commercial fishermen. The idea was to assure a viable commercial fishery into the future and the commercial anglers would be willing to pay the cost of extra production. Their funds went into the hatchery system as well as habitat projects. The Mokelumne Hatchery has a strong emphasis on salmon and has been on the cutting edge of experiments to increase salmon availability off the California coast. The original Salmon Stamp Enhancement of the 1970s has evolved into a three way partnership of the Department of Fish & Wildlife, the Commercial Salmon Association and the Coastside Fishing Club. The Mokelumne River Hatchery will be raising and releasing 5.4 million salmon this year. 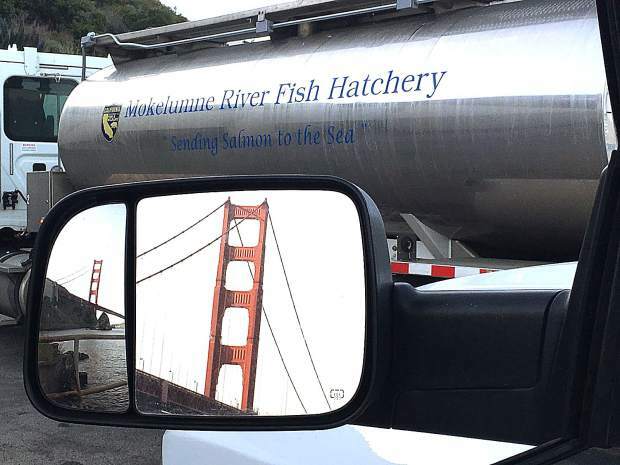 The hatchery has a trucking program to get the juvenile fish close to or in the ocean right from the hatchery. The most noticeable of these are the fish plants along the coast from the Golden Gate down to Santa Cruz. A large effort takes place at Pillar Point Marina in Half Moon Bay. Once per week for three weeks in the spring the hatchery trucks 240,000 salmon to be placed in a net pen in the marina. The fish are kept in the pen and fed for five days to acclimate before being released prior to the next shipment arriving. This year a total of 720,000 will be planted here. Another location for direct ocean plants is Santa Cruz Harbor where 120,000 salmon will be planted. These fish are only held for a couple of hours in a pen to acclimate before being sent on their way. The largest direct ocean plant takes place at Fort Baker at the north end of the Golden Gate Bridge. It is not random when these fish are released. The plant is timed for the beginning of an outgoing tide that coincides with twilight. Not only are the juveniles fodder for swimming predators, but the birds are a significant factor. By planting in a high current location at dark, the fish are widely scattered before the birds begin feeding the next day. All of the fish placed into salt water are delivered by trucks with 50 percent salt water in the tanks. Another release location is the lower Delta just above the Antioch Bridge where the Sacramento and San Joaquin Rivers join. These plants take place from mid-April through early June. The trucks place these fish into floating net pens which are then moved out to mid-channel at the start of the out going tide, and the fish are released. This is never done for more than two consecutive days. More than twice in a row and the stripers catch on and they will be waiting for an easy meal delivered by Department of Fish & Wildlife. The third planting location is the Mokelumne River itself. The reason for the statistical data on the origin of salmon is the tagging. All of the salt water planted fish get tags in their noses and 25 percent of the river released fish are tagged. The survival of the salmon varies according to where they get released. Those released into the salt have a three percent return, those planted in the Lower Delta have a one-and-a-half percent rate and the river released fish are way below one percent. Bill Smith mentioned that it is not just release location that determines how well the salmon population fares. In recent years the ocean has produced an abundance of food that has helped the survival rate as well as fish growth. Another diet factor is the food fed at the hatchery. A decade ago the Mokelumne River facility led the way in experimenting with the diet. They began purchasing food from Washington State that is primarily ground up fish. It is a more expensive food that produces a higher quality salmon. This food is now standard in the other valley hatcheries. Another diet innovation occurs two weeks before release of the fish planted directly in salt water. These salmon are switched to a “sea ready diet” that is salt infused to get them ready for the ocean. The ocean salmon success of recent years is due to a number of factors. Bill Smith noted that there is a 10 year cycle to salmon numbers. We are currently in a high production time of this cycle. Each of the innovations in planting, feeding and managing the hatchery helps to keep the numbers up. There are many other environmental factors from water diversions, to depredation in the rivers and pollution, that have to be worked on to keep these fish as a viable resource. The Mokelumne River Hatchery story is an excellent example of a public-private partnership producing some great results. The Commercial Salmon Association along with the Coastside Fishing Club, that contributes volunteer labor as well as funding, work with the Department of Fish & Wildlife to achieve a common goal. From an anglers perspective it is worth while noting that a percentage of the salmon planted at Pillar Point and Santa Cruz do not return to the Mokelumne River. Some of these fish return to the harbor where they were introduced into the ocean. I have heard great reports from these harbors in the late August through early October time frame. As Bill Smith said, “It is possible for a young man to ride his bicycle to the harbor and catch a salmon in the ocean.” I consider that a great measure of success.